This site has been set up by the Patrick Foundation, an independent research network, to provide a down to earth, common sense base, for all those open minded people who seek the highest standards of information on human origins, history and human relations subjects. We supply and recommend specialist books, present scientific and archaeological papers and display visual archaeological history in a range of formats. 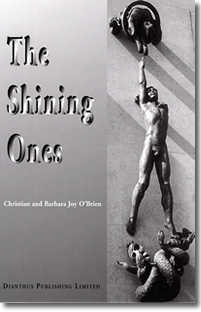 Featured and central to this site are the mind stretching books by Christian and Barbara Joy O'Brien - The Genius of The Few, The Shining Ones and The Path of Light. 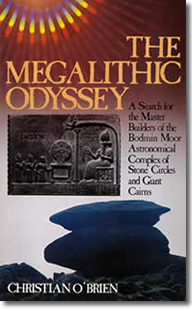 We have also featured the O’Brien’s earliest groundbreaking discoveries An Integrated Astronomical Complex – Line A Loxodrome - in East Anglia and Megalithic Odyssey featuring the Bodmin Moor Astronomical Complex of Stone Circles and Giant Cairns, both revealing great sophistication in mathematics, surveying and astronomy, together with the use of the most ancient world-wide standard unit of measure left by the Shining Ones, proving detailed knowledge of the earths dimensions around 2,700BC, and facilitating the authors successful search for the Master Builders of an earlier civilisation recorded by the Sumerians, who arrived in Southern Lebanon around 9,500 BC. Much of the evidence contained within these books pre-dates all religions, which with the enlightenment provided by the authors, can be seen to be distortions or corruptions of simple truths, but clearly indicate a single original benevolent source and a unity of truth, under good laws.. The Secular (non-religious) record of the Garden of Eden creation story from the Nippur Temple Library, in Sumer, the most important archaeological discovery of all time, is not only being ignored by academic, religious, and political establishments, but the key archaic cuneiform tablets have been removed from public access and scrutiny, through the lack of understanding and a religious bias. These tablets were handed to the Reverend Professor George Barton of the Quaker Bryn Maw College, Pennsylvania around 1909 for translation. He was only able to translate a small part of the texts, identifying correctly the name Kharsag. He considered the texts to be the oldest religious records and interpreted them as incantations and hymns. However he identified the key people involved - An, Enlil, Enki and Ninkharsag. The current position is that they and other linked cuneiform tablet translations are now classified as fragments or versions of Oxford University established myths, instead of the detailed secular record of Sumerian history provided by Christian O'Brien. The established myths were partially translated according to biased religious standards, this superseding the importance or differences in the tablets themselves. A problem for academic establishments sadly focused on categorizing and filing, rather than achieving a full understanding of the meanings. Christian O’Brien CBE M.A. has to be considered as the only practical and independent scholar to have mastered the secular Sumerian cuneiform records by starting with the original picture signs, as displayed on the Phaistos Disc, from which the archaic cuneiform had evolved. In the books he demonstrates his unique grasp of ancient languages and their origins, providing an alternative translation of the Genesis texts and further revealing confirmation of our non-religious history from within the Books of Enoch. 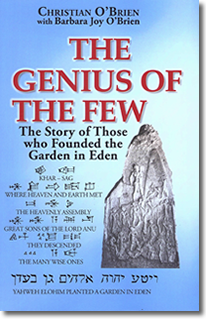 Our visit and survey of the Garden of Eden site below Mt Hermon in 2009, confirms the descriptions set out in the books by the authors. The settlement of the Anannage was indicated by the above ideograms which had the phonetic value of gar-sag, or Kharsag, and appears to mean either the principal, fenced enclosure, or the lofty, fenced enclosure. Possibly both translations are valid. 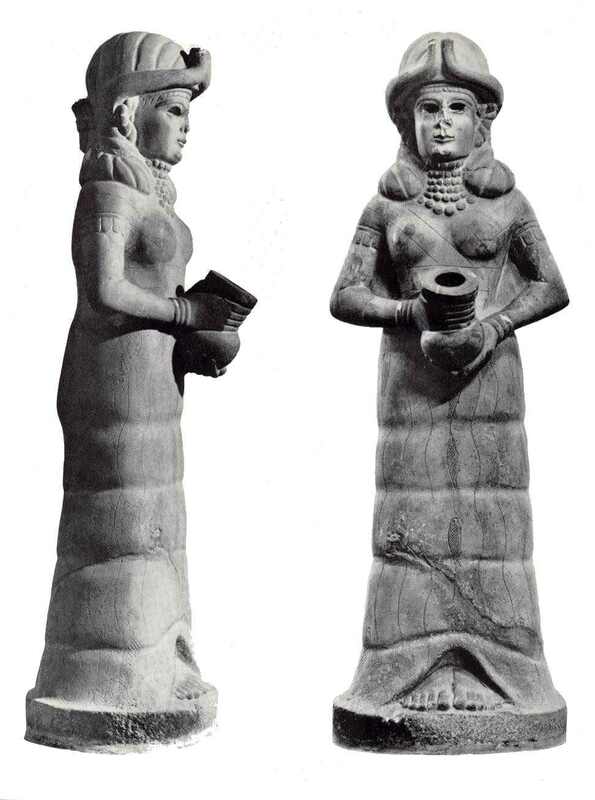 The Anannage were the Sumerian equivalents of the biblical Angels. Only after they had disappeared from the Middle Eastern scene, were they worshipped in the religious sense. Then they were then so enveloped in supernatural trappings that their intrinsic advanced and benevolent characteristics were swamped in a morass of pseudo-religious adulation - Christian O'Brien CBE M.A. in the Genius of the Few and the Shining Ones. 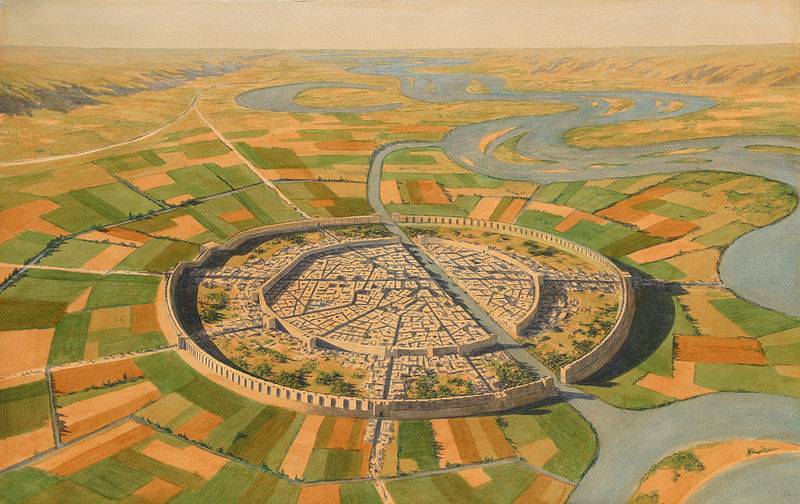 The City of Mari on the Upper Euphrates was contemporary with the Sumerian administrative center at Nippur, where the secular records were found, and was dedicated to Ninkharsag (or Ninhursag). Mari was one of the great Golden Age trading City States, a product of the Divine Council appointed kingship, the laws (Edicts of An and Enlil), and the brilliant social organization of the Anannage. Ninkharsag, was wife of Enlil, Goddess of Irrigation, Governor of the Garden of Eden/Kharsag, and mother of daughter Inanna and son Ninurta. She was also known around the world as Isis, the Serpent Lady, Mama, Ma, Mari (Goddess of the Basque), Kali, Ka, and Coatlicue. Founded around 4,500 BC and contemporary with Uruk, further south down the Euphrates, together with City States in the Jordan Valley and Kana'an, over 200 craft trades and guilds were formally recorded before 3,000 BC. Below is a depiction of Mari in its prime, possibly before the Koefels cometary impacts over the Austrian Alps in 3,129 BC. This event was accurately recorded on a Sumerian clay Planishere sky map by astronomers, an artifact mistranslated by Zecharia Sitchin. Final devastation followed with further Taurid stream cometary impacts across the region in 2,345 BC. The first of these impacts appears to have brought an end to the great city of Uruk. The second bringing to an end the Golden Age of the City States from the Mesopotamia to China, accompanied by climate change moving monsoon rains south, leading to the desiccation of the Sahara, Arabian, and the Indus Valley Thar deserts. These events triggered further major migrations around the world – The Mari artwork below is by Balage Balogh. White stone statue of the Lady Ninkharsag (Mari locally, Mama in Akkadian, Isis in Egypt, and the mother of Inanna and Ninurta), in the guise of the Goddess of Irrigation, found during excavations at Mari (Tell Harari) on the Upper Euphrates in Syria, now on display in the Aleppo museum, Syria. Ninkharsag was the daughter of Anat, wife of An, who was the leader of the Anannage. Her statue had been placed at the center of the two hundred acre administrative area at Mari, one of the Golden Age's great trading City States on the Euphrates, 150 miles north of Babylon. A city dedicated to her around 4,500 BC, as the figure head of the early Goddess Culture. From the bowl flowed a fountain into the pool surrounding the statue. Contrary to speculation she is not wearing a space helmet. With this Settlement will come prosperity; an enclosed reservoir - a water trap - should be established. The good land is full of water; because of the water, food will be plentiful - Lady Ninkharsag - Kharsag Epic No. 2 - The Arrival of the Anannage. 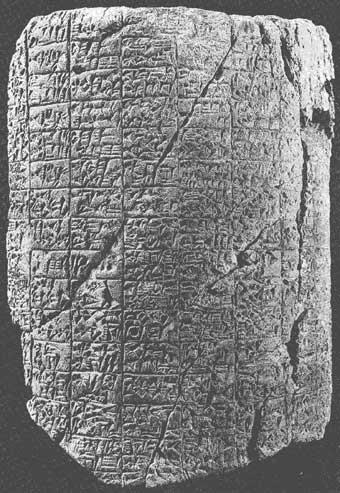 Translation of the archaic Sumerian cuneiform tablet No.8383 – recovered from the remains of the Nippur Temple Library in 1986-8 by the University of Pennsylvania under Professor Haynes. Taken from their detailed recorded history of the Garden of Eden in Southern Lebanon, below Mt Hermon, which they called Kharsag, meaning head enclosure. Nippur Archaic Cylinder - To judge from the script, the Nippur cylinder illustrated on this plate below (8383 in the Nippur collection of the University Museum) may date as early as 2500 BC. 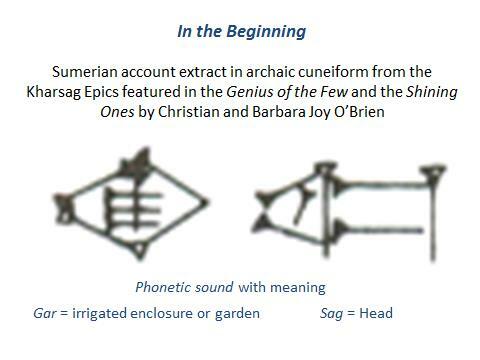 Although copied and published by the late George Barton as early as 1918, its contents, which center about the Sumerian air-god Enlil and the goddess of Ninhursag, are still largely unintelligible. Nevertheless, much that was unknown or misunderstood at the time of its publication is now gradually becoming clarified, and there is good reason to hope that the not too distant future will see the better part of its contents ready for translation - From Sumerian Mythology by Samuel Noah Kramer 1963. In 1971 Christian O’Brien retired from the oil industry and applied his skills to the translation of these tablets, publishing his results in the Genius of the Few in 1984. The autographed texts and transliterations from the original Sumerian, cuneiform-inscribed tablets are to be found in Miscellaneous Babylonian Inscriptions by Professor George A. Barton, published by the Yale University Press and the Oxford University Press in 1918. The tablets, themselves, are part of the Nippur collection held in the University Museum at Philadelphia, U.S.A. Data necessary to their identification is listed below. Kharsag Epic numbers and titles are those allocated in this volume. Nine Kharsag Tablets with Pennsylvania University Museum Number. Notes on the Tablets by Christian O’Brien - The biblical story of the Garden in Eden has had many counterparts; but their documents are often little known outside specialist circles. Even within these circles, few have recognized them for what they are, as they tend to be obscured by apocryphal overtones. But one, fortunately for our thesis, was written in clear and secular terms, unmarred by those deification processes, which were later to bring the story into such disrepute. That counterpart was inscribed on clay tablets in Sumer - doyen of the civilizations born in the lower Mesopotamian Valley - where a whole series was made over a period covering the third millenium BC. They give the impression of being coveted library possessions, which were copied in many places, and in may centuries, in sequential re-printings. The copies from which the account in these chapters it taken, were buried under the destruction of war, and were not brought to light again until American archaeologists excavated at Nippur (a Sumerian city some eighty kilometers south-east of Babylon) at the beginning of our own century, nearly five thousand years after they had been inscribed. Learning from History Part 10 – The Garden of Eden – PowerPoint. Their progress starts with the establishment of a further six major settlements by members of the senior council at Jericho, Ba'albek, Ebla, Catal Huyak, Olympus and On, which soon followed their establishment of the Kharsag (Garden of Eden) site. The development of these city states eventually led to the great civilizations in the Levantine Corridor, Mesopotamian plains, Egypt, Iran, India, China and the Americas, which began to evolve with domesticated crops and animals over the following 2,000 years, and followed by the search for and trade in natural resources, especially the key metals. 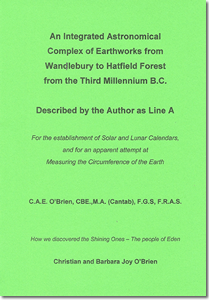 Whilst we unreservedly recommend the Genius of the Few as a starting point and an easy read for all students on the origins of civilization and agriculture from the ancient texts, the Shining Ones represents a more complex 752 page major compilation of evidence to support the full O'Brien thesis. A thesis which describes the re-start of civilization and agriculture in the Levantine Corridor following global cataclysm and the Younger Dryas Ice Age, which ended c. 9,600 BC, together with their global influence. 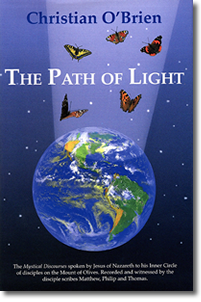 The Path of Light presents the rediscovery of Jesus’s teachings to his Inner Circle of both men and women, from a key part of the lost Books of the Saviour, bringing together the important links on spirituality and supporting the existence of the one original benevolent source for all religions. Christian O'Brien's revised translation and arrangement of the Askew and Bruce Codices, 2nd century AD Egyptian Coptic copies of original documents, recording the spoken words of Jesus of Nazareth, is presented within the Path of Light, providing authoritative and detailed support for the existence and the journeys of the soul in other dimensions. This is called by Muslims the Injīl, or Ingil, which is the Arabic name for what Muslims believe to be the original lost Gospel of Jesus (Isa). The Injil is one of the four Islamic holy books, which the Quran records as revealed by God, the others being the Zabur (possibly the Psalms), the Tawrat (the Torah), and the Qur’an. Of significance within these texts, are the references that they were recorded and witnessed by the disciple scribes Matthew, Philip and Thomas - the required process of authentication of important documents, under the Hebraic law of that time. This source document makes it clear that Jesus survived the crucifixion. The concern expressed at the Court of Herod and by Tiberius Caesar at the threats to the life of Jesus, are worthy of further research to support our full hypothesis. Jesus and his twin brother Thomas - Our further research reveals the important clues linking Jesus with the Essenes, together with the courts of Herod, Augustus and the British Kings. There was a clear message from the Sermon on the Mount of Jesus’ knowledge of the Druid (Essene) teachings. We have revised our findings to support the evidence of Jesus and his twin brother Thomas in Britain for their education after the age of twelve. The boys being sent by Augustus and Tiberius to be adopted by Tenvantius Tascovanus king of the Catuvellauni at Wheathampstead. This leads to Jesus succeeding his step-father in 10 AD as Cunobelinius, the first Pendragon (King of Kings) of the Britanic Isle, appointed by the Druid Council. Twenty two years later, Jesus and Thomas were sent to Palestine by Tiberius Caesar, both playing key parts in Augustus and Tiberius’ Pax Romana – Roman Peace. Key evidence from a pre-800 AD Vatican genealogy identifies three Joseph of Arimathea - grandfather, father and son. The family, closely linked to the Herod family, ran the trade routes for the Roman Emperors from Rome. The grandfather was given the hereditary title of arimathea, which should be spelt and pronounced ha rama theo. Tiberius Caesar asked the Roman Senate to give Jesus the title of God for his peacemaking work in Britain and Jude. The Path of Light and the Acts of Thomas provide the solid evidence of the important roles of both Jesus and Thomas in not only re-stating and teaching the ancient Druid (Essene) philosophy and practice, but also in the development of the Eastern Syriac Church. This evolved from Antioch and Edessa in Upper Mesopotamia, into the Jacobite and Nestorian Christian denominations, mainly active outside Europe, and for a considerable time dominating most of Asia from the great centers of learning from Bagdad to Taxila in the Indus Valley. Islam evolved from the great wisdom and scholarship of the Eastern Syriac Church, which had a far more significant and benevolent influence than the Catholic Church. Mahammad not only had a very high regard for Jesus, but also demonstrated an understanding of the equal roles of women in Medina. His wife, who employed him in her trading business, was a Hanif (perfect one) as was Abraham. The original tolerance of his teaching towards other religion’s, has now disappeared amongst the many undisciplined lawless break-away groups, avenging past religious injustices. However, the clear message of Confucius and Jesus that you should do unto others as you would have them do unto you, a very ancient instruction under the law, has been ignored by leaders and rulers, resulting in political conquests, wars, starvation, death, genocide, and disruption in the name of religion and politics, which continue to this day. It is now accepted that Philip carried Jesus' teachings to Western Europe, and Thomas took them to India, founding the Church at Kerala in 54 AD. The earliest known version of the Acts of Thomas, in the St Catharine's Monastery library Sinai, makes it clear that Thomas was having regular meetings with Jesus in India, after the crucifixion. Evidence from Kings College, London, within King Alfred’s Anglo Saxon Chronicles, record that Alfred had sent an embassy under Sighelm, the Bishop of Sherborne, around 882 AD, to pay their respects at the grave of Thomas in Southern India. This important information may open up links to the important role for Thomas as King of the Atrebates at Wallingford under Jesus, and Colchester as Camulot, before British administration was moved to Carlisle, as result of the Iceni revolt and massacre of the Druids by Roman General Suetonius in AD 60 on the instructions of Nero. Of the greatest importance to the future of religious harmony today, is that this O'Brien translation of these source documents has established that Jesus was teaching Surat (soul) Shabd (word) Yoga (union) to his inner circle of disciples. This advanced teaching to both men and women was a feature of all high cultures in the ancient world centered on the archaic Druidic philosophy and practice, which had evolved from Kharsag in the land of Cana’an. Women had total equality with men, and those best trained and qualified in a practical sense, led the communities to a peaceful and harmonious existence, under good laws, and first class social organization. As our research has gathered pace we have been able to add supporting evidence for the O'Brien scholarship from a wide range of authors and other sources. This includes the content of sixteen Learning from History YouTube Video Presentations, also found on the Holistic Channel, together with PowerPoint, Sound Presentations, and Radio broadcasts, found on this website. DVD’s on all the presentations are available on request from the Bookshop. Learning from History Part 14 – Origins of Agriculture and the Garden of Eden by Edmund Marriage, summarizes the key supporting evidence of the arrival of the advanced group, who had survived the 10,850 BC cataclysm and the Younger Dryas Ice Age.